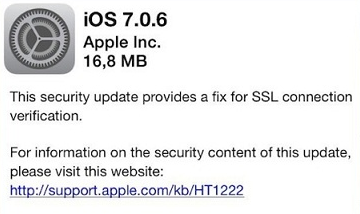 Apple released an IOS 7.0.6 and 6.1.6 update to fix an SSL security issue that was related to in-app purchases that could have been made with insecure authorization. If you are updating your phone, I would recommend a Wi-Fi connection. It’s around 13mb and took me 5 minutes to complete. It seems to take a little longer than expected for an update of this nature, so only do it if you have a little spare time.